Louisville, KY (December 5, 2014) – Dr. Garry Lacefield, a forage extension specialist and professor of plant and soil sciences for the University of Kentucky, is the recipient of Kentucky Farm Bureau’s 29th annual Farm Public Relations Award. He was recognized on December 4 during the general session of KFB’s annual meeting at the Galt House in Louisville. Dr. Garry Lacefield (center left) and his wife, Cheryl (center right) received the 2014 Farm Public Relations Award at Kentucky Farm Bureau’s annual meeting in Louisville. Presenting the award is B. Todd Bright, KFB Communication Division Director (left), and David S. Beck, KFB Executive Vice President (right). KFB’s Farm Public Relations Award was developed to recognize Kentuckians who significantly generate a better public understanding of agriculture. The recipient’s accomplishments can be compiled either on a volunteer basis or as part of an individual’s job, but the individual cannot be a professional writer or broadcaster. The winner is recognized with a commemorative plaque and $300 prize. Dr. Lacefield, a native of Ohio County, has worked as a forage extension specialist for 40 years. During this time, he has authored and co-authored more than 300 extension publications, papers, articles and book chapters. He is co-author of the book, Southern Forages, the best-selling forage book in the country that has also been translated into five different languages, and just recently co-authored a new book, Forage Quotes and Concepts. Dr. Lacefield also developed and is senior author of Cow Country News, a publication of the Kentucky Cattlemen’s Association, and has written a monthly column in it for the last 21 years. Graduating with his bachelor’s and master’s degrees from Western Kentucky University and his Ph.D. from the University of Missouri, Dr. Lacefield now travels regionally and globally lecturing to share his research, teaches countless courses and online webinars, and is interviewed regularly on radio and television programs. His efforts helped develop the Kentucky Grazing Conference, Kentucky Alfalfa Conference, and the Kentucky Forages session at the Kentucky Cattlemen’s Association annual convention. Dr. Lacefield is also a member of and has served in leadership roles on numerous industry organizations across the state and nation, earning a lengthy list of distinguished honors from most along the way. Above all else, Dr. Lacefield was identified in his nomination from Mercer County Farm Bureau as an advocate for the agriculture industry with unparalleled message and passion for his work. 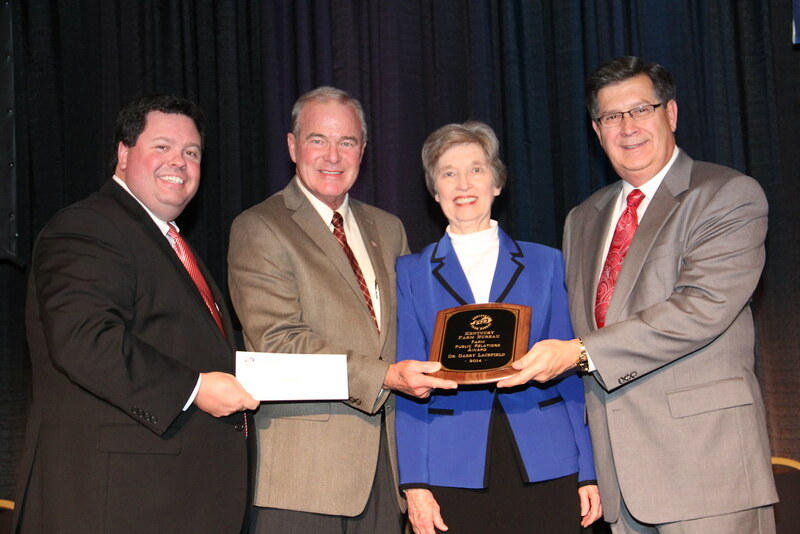 Photo Cutline: Dr. Garry Lacefield (center) received the 2014 Farm Public Relations Award at Kentucky Farm Bureau’s annual meeting in Louisville. Presenting the award is B. Todd Bright, KFB Communication Division Director (left), and David S. Beck, KFB Executive Vice President (right).